Lately we've attended a couple of workshops and lectures about Porec past. Seriously, this town tells stories; like the fact that even in Roman times, people kept fish farms in today's Tarska Vala; or how Porec got seriously bombed during the WWII due to its shallow seas – curious?! Porec is a small town with barely 15.000 people but its old town is full of wonderful historical and cultural sights worth exploring. The complex of Euphrasian Basilica consists of the church, memorial chapel, atrium, baptistery, and episcopal palace. It dates back from 6th century, and all basic parts are well preserved. Euphrasian Basilica was the last basilica built in Porec in succession from 4th to 6th century, and the only one still standing. The complex is UNESCO World Heritage Site since 1997. The views from the 16th-century bell tower are awesome. Back in Roman times, this place was a forum, a teeming heart of ancient Porec and the center of Porec public life during roman times. Today, the Marafor Square is a center of Porec nightlife with popular bars, street terraces and live music. Our top pick is the Old Time, one of the oldest bars in town and locals' favorite. Located northwest of the Marafor Square, in a small park near the Villa Polesini, you can see the remains of the Great Temple and the Temple of Neptun (just fragments, part of a wall and foundations). The Temples were built in the 1st century. The site is open to public, and free of charge. If you visit the site in the early evening, you can enjoy wonderful sunsets from the Villa Polesini garden. The Villa Polesini was built in the 17th century, and last renovated in 2010. It's managed by Valamar Hotels & Resorts, and today it serves as one of the most popular wedding venues in Porec. The Istrian Assembly Hall, or better – the building itself – has a very interesting history, and was used for different purposes since its construction. Built in 13th century as a Gothic Franciscan Church, in 1806, the church was proclaimed a secular building. In 1844, its ground floor was turned into a wine cellar, and the first floor served as an Istrian Parliament building until 1918. Today, the building belongs to the town of Porec, and serves as a venue for various cultural events. 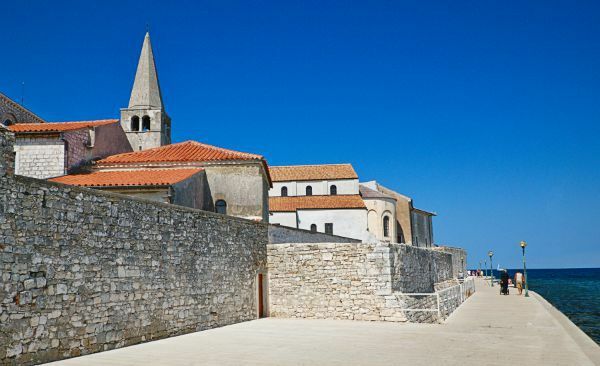 Back in 15th century when Porec was under Venetian rule, the town was surrounded by fortification walls and even nine defense towers. Today you can still see the town walls, that are well preserved on the west part of the old town, and three towers. The North Tower, or rather a remains of the North Tower are best seen when you watch it from the outside of the old town. The Round Tower houses today a cozy bar, Torre Rotonda. The interior is interesting, the tower is well preserved, and there is a nice terrace at the top. We like to have a drink here from time to time when we feel like having a quiet drink, especially because very few locals wander here. Drinks are a bit expensive, and the views, although nice, are short of spectacular. However, it's a nice and relaxing bar, definitely worth a visit. The Pentagonal Tower was built in 15th century in gothic style, and it features a relief of a Venetian lion at the facade. The tower is located at the entrance of the old town, right at the begining of the main street – Decumanus. Today it houses an expensive restaurant, and if you want to visit a tower, you'll definitely feel obliged to have at least a drink. The old town Porec features many interesting houses, and former family palaces. Walking along the main street – Decumanus, you'll pass by the Zuccato Palace, a beautiful palace with gothic-style windows, and a Venetian bifora. The house was built in the 15th century, and today it houses an art gallery. Taking a stroll toward the Marafor Square, you'll notice the Romanesque house. This house is hard to miss – built in the 13th century, its look and style are totally different from all other buildings in Porec. The house features double-lancet windows, and a wooden balcony. Next to the house, there is a 15th century stone well. Just few steps away, you'll see another interesting house – the House of Two Saints. Also located in Decumanus Street is the Leoni Palace, named after figures of lions on its facade (Palazzo dei Leoni). The house also feature beautiful Venetian-style windows. The Kanonika is next to the Euphrasian Basilica. It was built in 1251, and today serves as a parish house. The Sincic Palace, a baroque palace built in 18th century. The Sincic Palace is today a home to the Porec Heritage Museum. Unfortunately, the museum is closed for renovation, and the opening day is still not set. However, in the lapidary of the Palace, every Wednesday, throughout the summer, you can enjoy Jazz concerts. There are many more interesting buildings in Porec, like the Bassi Palace on the Marafor Square, Manzini Palace, and a baroque Vergotini Palace. Located on the main road from Porec to Vrsar, the Sculpture Park spreads on a 10-hectare meadow. It features bronze, wood, and concrete made giant sculptures of a famous Croatian sculptor Dusan Dzamonja. His works are also on display in MoMa in NYC, and Tate Gallery in London. St. Nicola Island is a small island just off the coast of Porec. Today, it's a tourist resort with hotels, and apartment complex, but it wasn't like this until 1980s. Greek priests werethe first inhabitants to the island back in 9th century, followed by members of the Benedictine Order. Many sailors, captains and merchants from entire Venice Republic would stop at the island to bless their ships. A lighthouse was built on the island in 1403. The lighthouse is 15 m high, and at time it was the highest lighthouse on the east coast of Adriatic. In 1789, the island was sold to the Polesini family, a noble family from Porec. In 1887 Benedetto Polesini built a summer house resembling a Tuscan castle. He devoted it to his wife Isabella. Today, the hotel and an apartment complex bear the same name – Valamar Isabella Resort. A karst natural monument, located 8 km northeast of Porec, Baredine Cave consists of five chambers. A guided tour lasts 40 minutes, and you'll be able to see interesting stalagmites and stalactites, underwater lakes, and a salamander – a pigment-less “human fish” endemic to this area. Full post on Baredine Cave you can find here. Hotel Palazzo, formerly known as te hotel Riviera, was the first hotel to open in Porec, back in 1896. The hotel was owned by Mr. Klein who at the time had hotels in Opatija, and Pula. The interesting story is related to the construction of this hotel. 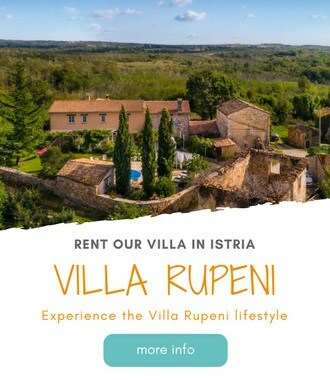 Mr. Klein really wanted to open a hotel in Porec, but at time couldn't obtain a building permit, so instead, from Lloyd's insurance company he purchased some sea within town's harbor. He simply constructed a small peninsula at the tip of Porec old town, and built the hotel Riviera. Today the hotel goes under the name of Grand Hotel Palazzo, a five-story property featuring 74 rooms and suites, an outdoor swimming pool, small spa & wellness center, a restaurant, and a popular cafe bar – Cafe Del Mare. Plan your activities in Porec with our detailed guide to things to do in Porec. Have a question? Please leave it in the comments below. Thanks for your comment, Mark! Any plans to visit here soon?